Some of these Clubs are under way, you can still sign up! to ask when you want to receive kits from months already shipped. The Meredith Collection has fit Santa’s face perfectly into your favorite state. 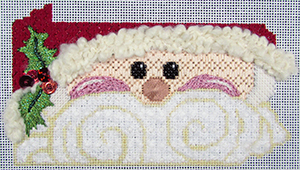 Kit includes: canvas, stitch guide, threads, embellishments and needles. Each state approx. 4x6” in size.